As Twin Attacks Kill At Least 34 in Brussels, How Should Belgium and Europe Respond? | Democracy Now! As Twin Attacks Kill At Least 34 in Brussels, How Should Belgium and Europe Respond? Human Rights Watch’s emergencies director. In the Belgian capital of Brussels, explosions have hit the international airport and a city metro station, reportedly killing more than two dozen people and wounding scores. Belgium’s federal prosecutor said the two blasts at the airport were carried out by a suicide bomber. There were also reports of shots fired before the explosions at the airport, which occurred at about 8 a.m. this morning. About an hour later, another explosion hit the Maelbeek metro station. “These really are two very central targets,” says Peter Bouckaert, emergencies director for Human Rights Watch and a native of Belgium. “The Schuman and Maelbeek stations are where most of the European bureaucrats get out of the metro to go to work, and these attacks took place just after 9:00, just as people were getting to the office, including my own colleagues at Human Rights Watch. They left the metro just minutes before these explosions took place. It certainly has shook Belgium to the core.” We speak with Bouckaert in Geneva for the latest. StoryNov 23, 2015Brussels Is Under High Security Alert, But Will Europe Address Muslims in “Marginalized Ghettos”? AMY GOODMAN: In the Belgian capital of Brussels, explosions have hit the international airport and a city metro station, reportedly killing more than two dozen people and wounding scores of others. Belgium’s federal prosecutor said the two blasts at the airport were carried out by a suicide bomber. There were also reports of shots being fired before the explosions at the airport, which occurred at about 8:00 in the morning Brussels time. About an hour later, another explosion hit the Maelbeek metro station. Early reports say 15 people died at the metro station, up to 13 at the airport, with more than a hundred wounded at both locations. European Union foreign policy chief Federica Mogherini spoke early today in Amman, Jordan. FEDERICA MOGHERINI: It’s also a very sad day for Europe, as Europe and its capital are suffering the same pain that this region has known and knows every single day, being it in Syria, being it elsewhere. We are still waiting for more precise news on the dynamics of the attacks in Brussels, but it is quite clear that the roots of the pain we are suffering around our region are very much the same and that we are united in not only suffering, our victims, but also reacting to this act and preventing radicalization and violence. AMY GOODMAN: We’re joined by Peter Bouckaert, Human Rights Watch’s emergencies director. He is originally from Belgium. He’s just returned from the Greek-Macedonian border, where he’s been working with refugees. Peter, can you talk about the places that were hit, the explosions? Your response to what happened today in your country of Belgium? PETER BOUCKAERT: Yes. These attacks have really brought Belgium to a standstill. They started with an attack at the departure hall in the airport, Zaventem International Airport, at about 8:00 a.m. And as people were absorbing this news and heading to work right during rush hour, the Maelbeek metro station, which really is right in the center of Brussels, right around where all of the European institutions are based, was hit by a second blast, in which at least 15 people were killed. Right now the public transport system has been shut down. The Eurostar and Thalys rail systems have been shut down. And many public buildings in Belgium have also been shut down out of fear of further threats. AMY GOODMAN: And can you talk about what’s happened, you know, following the arrest of Abdeslam this weekend, one of the suspects in the November attacks who did not blow himself up? He was found just a block from his childhood home. Can you talk about the community he’s from, that you know well? PETER BOUCKAERT: Yes. He comes from a relatively marginalized community. It’s not necessarily a poor community, but Molenbeek certainly feels very much separate from the rest of Belgium. It’s mostly a migrant community, mostly of Moroccans and other North Africans, who have never really been integrated into Belgian society. And for months, he was able to hide out in this neighborhood. It’s very clear that Belgium does have a problem with radicalization, which certainly has come out of the deep marginalization that some of these communities feel. And most of the Paris attackers actually came from Belgium. It’s quite clear that the attack was planned in Molenbeek and other Belgian neighborhoods. AMY GOODMAN: And the significance of the areas that were hit? You have the airport at rush hour, and that looks like it was a suicide bomber. We don’t know how many dead, in the range of more than a dozen, and many scores wounded. And then you have the metro station. This particular metro station, Maelbeek, is right near the European Union and the European Parliament? PETER BOUCKAERT: That’s correct. These really are two very central targets. The Schuman and Maelbeek stations are where most of the European bureaucrats get out of the metro to go to work, and these attacks took place just after 9:00, just as people were getting to the office, including my own colleagues at Human Rights Watch. They left the metro just minutes before these explosions took place. It certainly has shook Belgium to the core. And many people are just staying at their offices right now as the entire transport system in Brussels has basically been shut down for the moment. AMY GOODMAN: We’re trying to reach someone in Brussels, but, to say the least, the phone and Internet is very spotty there. Peter, you’ve just returned from the border. We spoke to you here in New York when you had come in for a day. You continually deal with refugees. Can you talk about the climate in Europe and if you think this in any way relates to what we’re seeing now, whether in Paris in November or today in Belgium? PETER BOUCKAERT: Well, I think we need to understand that there’s actually two crises taking place in Europe. One is the crisis of many young radicalized men and women heading from Europe to fight in Syria and now returning to carry out some of these attacks. And then there’s the refugee crisis of hundreds of thousands of people who are fleeing from the exact same terror that these radicalized youth are bringing to Europe now. And it’s unfortunate that in many European minds and minds across the world, the two crises have become conflated, and refugees themselves have become to be seen as a security threat. What Europe needs to address is the chaotic situation at its borders at the moment, of which these radicalized youth certainly took advantage. But at the same time, it does have to provide refuge for people fleeing from the same terror that hit Paris a few months ago and Brussels just this morning. AMY GOODMAN: Overall, right now, the approach when something like this happens, we saw in November, when the horrific terror attacks took place and 130 people were killed, a very serious crackdown, the raiding of people’s homes, particularly people in the Arab community in Paris. 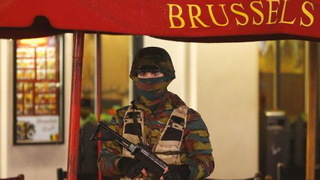 What are your concerns right now about what will come out of this, now Belgium on the highest alert? PETER BOUCKAERT: Well, I think we should take a slightly longer-term historical perspective and see what happened after the United States during the Bush administration overreacted very strongly to the 9/11 attacks. Many of the problems that we face today are at least related to that overreaction. It’s very important that Europe deals with the security threats it faces. Certainly, there are significant security threats with young people returning radicalized from Syria. But that reaction and the security response has to be proportionate, and it’s important that it doesn’t target people who have nothing to do with this and that some of the underlying social issues in Belgium and France and other European countries, the marginalization and the joblessness and hopelessness in some of these communities, is also addressed, because we—this is really a struggle for the hearts and minds of young people in Europe. An overreaction will just feed into the extremism that we saw hit Brussels today. AMY GOODMAN: Peter Bouckaert, I want to thank you for being with us, Human Rights Watch’s emergencies director. He’s speaking to us from Geneva, but he is from Belgium, where these horrific attacks took place today at the airport and a local metro station. At the current count, it looks like 28 people have died, scores of people have [been] injured, but those numbers seem to be going up. This is Democracy Now! When we come back, all the major presidential candidates addressed AIPAC yesterday, the pro-Israeli government lobbying group in Washington, except for Bernie Sanders. We’ll have a debate on what they said. Stay with us. Brussels Is Under High Security Alert, But Will Europe Address Muslims in “Marginalized Ghettos”?